In Norse mythology, Odin descends, at one point, to the underworld to learn from the Norns - wise and ancient women - what shape the future is likely to take. The aged ones instruct the god that to find the knowledge he seeks he will have to pluck out one eye, hang himself upside down from the world tree, and allow himself to be pierced by a spear. For nine days Odin's body hangs lifeless, his spirit ranging far and wide through all the nine worlds, on the back of the eight-legged horse, Sleipnir, an animal capable of breaking through any barrier. Odin saw and learned much. After nine days the Norns wet his lips with magical waters. He saw and learned even more. I﻿ was thinking. It's funny. You spend so much time sometimes thinking about and speculating on future events that may or may not happen, and how you may or may not respond. You always imagine yourself acting a certain way. 'That's what I'll say,' you tell yourself. But when it comes down to it, when the long awaited moment arrives, you often find yourself thinking and saying thinhs entirely differnt to what was in your script. Why is this? Why do we seem to know so little about ourselves - about who we really are - those secret, deep-down motivations and guiding principles beneath the politically-correct and socially conservative veneer? It's like Porcupine in Andrei Tarkovsky's film, Stalker. He goes to the mysterious 'Room' at the heart of the 'Zone', where your deepest wish - the most secret, deep-down desire - is made to come true. His visit's stated aim is to bring about a cure for his sick brother. When he returns to the world he finds himself rich beyond measure. His brother remans ill. The money doesn't make Porcupine happy. Quite the reverse. As they say, you never know until you get there, etc. Take the other night, for example. I was sat in Fringe with a mate, discussing the outstanding longevity of Bernard Hopkins (the boxer). Eyes Without a Face by Billy Idol was playing on the jukebox. Great bassline. I was happy. A man in a trilby came up and said, "I'm opening a Tory party themed bar in the Northern Quarter. I need a business partner. What do you say?" He went on to talk a little about his plans for the venture. He envisaged three rooms in all: a 'Free Market Room', where punters could buy and sell items to each other if they so desired, then a 'Philosophy Room', featuring books by famed conservative thinkers such as Edmund Burke, Michael Oakeshott and Roger Scruton. 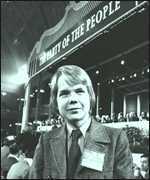 We were then told about a 'Young Conservatives Room', where William Hague's classic speech to the 1978 conference would be played on a loop. "What do you think?" said my friend after the intruder had gone. "Not a lot," I replied. "Let's carry on as we were before. The guy's an oddball." A - Commercial, artistic and social suicide. B - An insult to the people of Manchester and my late father, who was a strong Trade Union activist. D - A genuine act of rebellion and creative assertion against the prevailing political, cultural and social mores dominant in this city - from the Town Hall downwards - what often feels like a stifling complicity of thought and action. Is that typical of the Left is when holding the reins of power - politically, culturally, etc? Or do I just imagine it? Am I simply acting in the lineage of the 'Great Manc Contarian', à la Mark. E. Smith or Anthony Burgess? Like I say, it's funny. Before it happened I had always thought my gut feeling would be one of A or C, while in the event I actually find myself wavering between B and D. Well, there you go. You never know until you get there. I do wish sometimes that I was a god and could ride on a magical, eight-legged horse down to the underworld and whatnot. I don't think I could hack all that Odin had to put up with though. Poor fella. I've never been a 'hard nut' in that respect. So, there you are :-) Any suggestions gratefully received.